Paul Dooley, one of the leading exponents of the Irish harp in its historical form and style - playing a 34 brass wire-strung harp, with a frame of cherry and soundbox made from of one piece of willow and plucking the strings with the fingernails. 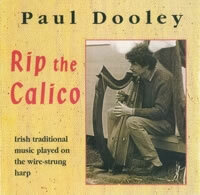 This CD showcases his pioneering work in performing Irish dance music (as on this CD) on his traditional harp. This recording also features traditional Irish music and compositions by both Paul Dooley and Neil Dickie. 1.The March of the King of Laois This tune was probably composed in honour of Ruairi O'Moore, sixteenth century head of the O'Moore clan. 2. 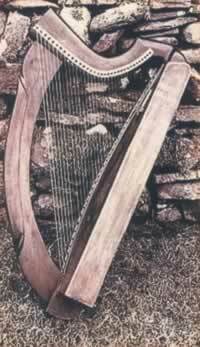 Mulhaire's, Rip the Calico, the Glass of Beer- (Reels) These are popular session tunes, the first suits the harp because of it's recurring arpeggio motif, the second one gives it's name to the album and the third was the first reel that I learnt on the harp. 3. Anach Cuain- ( Slow Air ) This is the air of a song that commemorates the tragic drowning of nineteen people on Lough Corrib in 1928. 4. Condon's Frolics, Garret Barry 's, Eddie Kell 's - (Jigs) These are three piping jigs I learnt in sessions. 5. O'Carolan 's Draught, John Doherty 's Reel Carolan apparently composed this tune during his stay in Munster. It was collected by Father Welsh of Sneem who was the original Father O' Flynn. The reel that follows comes from the repertoire of John Doherty the legendary fiddle player from Donegal. 6. The Raven 's Wing* - (Slow Reel) This tune started life as a reel version of the Irishowen jig before eventually evolving into it's present form. 7. The Sweeper 's Tune* I composed this tune for my favourite street sweeper. 8. Fear an Bhata - (Slow Air), Captain O 'Kane - (O 'Carolan) This is the air of a song a friend of mine used to sing, probably of Scottish origin. Captain O'Kane came from a distinguished family in Antrim, little else is known about him. I first heard the tune in Brittany from Jean - Pierre "Bovelo" on the piano. 9. The Clumsy Lover**, The Otter 's Holt, Maries Wedding* - (Reels) I learnt the first of these in Edinburgh some years ago where it was very popular and still is with Scottish pipers. The second tune comes from the inspiring playing of Noreen O 'Donoghue a harper from Dublin and I composed the third as a wedding present for my sister. 10. Jackson 's - (Slow Reel) This tune appears in Ceol Rince na hEireann - Cuid 1. 11. Inishowen*, Pull the Knife and Stick it Again - ( Jigs ) I composed the first of these as an exercise for one of my pupils. It 's dedicated to the Kealy family of Inishowen, the second is a well known session tune, played here in Bm instead of Em, the second part is altered to suit the higher key. "Their style is not deliberate and solemn but quick and lively nevertheless the sound is smooth and pleasant. It is remarkable that, with such rapid finger work, the rhythm is maintained and that, by unfailingly disciplined art, the integrity of the tune is fully preserved..."
"...they played the tinkling sounds on the thinner strings above the sustained sound of the thicker strings." The music played here does not go back to medieval times; but the harp heard on this recording has thirty four strings of brass, it 's frame is made of cherry and it 's soundbox of one piece of willow as were the harps played by the old harpers.